The “Adam Folker” Facebook page has over 1,500 likes. Folker, a UC Irvine men’s basketball player, has over 2,200 friends on his personal Facebook page, over 5,311 followers on Twitter and over 7,290 followers on Instagram. This man is a self-made, social media guru and well on his way to being a phenomenon. Have you heard of the #FolkerSystem? So have we. But you might have found yourself wondering, what exactly is the #FolkerSystem, and how do so many people seem to know about it? Well, it all starts with the 6-foot-9-inches, 225 lb. Canadian-born center. The tall, blonde, Newport-dwelling senior seems like he has it all figured out, but the #FolkerSystem has humble beginnings. As the son of two athletes, Folker’s childhood consisted of youth sports that included tennis, golf and hockey. Both his mother and father played college ball and shared their love and passion for the sport with Adam and his older brother, Mike, who now shares the same alma matter as their father — Acadia University in Wolfville, Nova Scotia, Canada — hundreds of miles away from the school that Adam now calls home, the University of California, Irvine. Despite having played a number of sports growing up, the Canadian followed in his older brother’s footsteps and began focusing on basketball after middle school. As what would be the equivalent of a freshman on the varsity squad in high school in the States, Folker was one of the smaller players on his high school team and began his high school career as a point guard. After breaking his leg in his fourth year at Markham District High School in Markham, Ontario, Folker opted to attend an optional fifth year of high school that the Canadian schooling system offers and is most commonly pursued by student athletes. Growing into himself and his role on the team, Folker finished his high school career at the age of 19, averaging 31 points, 12 rebounds, eight assists and four blocked shots per game. It wasn’t until late in his final high school season that the now center even considered attending UCI, let alone heard of the UC in the OC. Knowing he wanted to play basketball at a Division 1 university, Folker was also attracted to the level of academic prestige at UCI. The recruiting trip was all it took to convince the Canadian to pack up and play for the Anteaters. In his first season sporting the blue and gold in 2008-2009, Folker played in 29 games with 10 starts, averaging 1.8 points and 2.2 rebounds per game. In his sophomore season, the center played in all 32 games with nine starts and averaged 2.9 points and 4.2 rebounds per game. A couple months after the close of his second year, during the second exhibition game of what would have been his junior season, Folker suffered an injury that resulted in a broken hand. Not only was the center dealing with rehab from the injury, he also learned that he needed hip surgery. With the business major forced to redshirt for the 2010-2011 season, Folker made his much-anticipated return to the court in the fall of 2011. Receiving the Big West “Best Hustle” Award for his junior campaign, Folker ranked first in the conference in field-goal percentage at .569 in league games and led the ’Eaters in rebounds with 6.7 boards per game. After the close of the 2011-2012 season, the center led the Big West in career rebounds with 411. Following that season, some might say that the #FolkerSystem was born in the summer of 2012. However, it was simply given a name. “It started out as a joke,” said the steadfast center now in his senior season with the ’Eaters. If the #FolkerSystem could be summed up into a few words, they could also be used to describe the entrepreneur: ambitious, passionate and hardworking. The disciplined fifth-year makes every decision with his body and basketball in mind to lead a healthy life. For example, the student athlete follows a strict eating regimen, consuming as many as 7,000 calories a day. With a routine that consists of eating mostly meat, vegetables, nuts and legumes, Folker has removed all gluten and starches from his diet. “I don’t eat bread, pasta [or] rice, [but I do] eat a lot of chicken,” the athlete shared. And it isn’t a complete day until the man behind the #FolkerSystem drinks at least one “green drink” that consists of wheat grass, barley grass, spirulina (which is a blue-green algae), cucumbers, kale, spinach, lemon, ginger root and coconut oil. But beyond standing for and promoting a healthy lifestyle, the #FolkerSystem is much more than meets the eye. To Folker, the #FolkerSystem is about being grateful for the opportunities that he has had the privilege to pursue. “[It’s about] using what I have earned through hard work and dedication to help others who have not been given the same opportunities. So why the social media? Why the Instagram, Facebook, Twitter and YouTube videos? Folker makes the clear distinction between mentoring and coaching, sharing that mentoring is something that he can see himself doing in the future. Drawing motivation from his own experiences, the student athlete leads by example and works to turn any instance into a positive situation. When it seemed like things couldn’t get worse as he faced nine months of rehab after hip surgery, Folker was encouraged by specialists to give up the game that he loved. Now in his final season with the ’Eaters and in 67 minutes of play thus far, Folker proved all of the disbelief wrong, and the no. 20 is 7-18 for a .389 field-goal percentage and is averaging 4.7 rebounds per game. 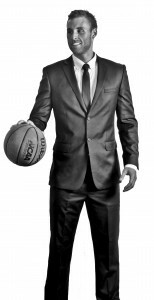 Without knowing whether professional basketball is in his future, the businessman knows one thing that he will certainly be pursuing post-graduation — the marketing business he started that specializes in sales leads generation. With more down time during the rehab for his hip than the athlete had ever had before, boredom was not a word in his vocabulary. The recovering athlete spent his time researching and not only started his business locally in Orange County, but brought it back home to Canada as well. When asked what inspired him to start the business and where he finds his drive, the goal-oriented Anteater shared his philosophy that he adopted from his favorite book, “The Magic of Thinking Big,” first published in 1959 by Dr. David Schwartz. “It’s about setting high goals for yourself and working to achieve them,” Folker reiterates. So even for as much as the #FolkerSystem has been inspired by and is perpetuated by Adam, it is also about the team — the UCI men’s basketball team. “UCI is a hidden gem. We have depth, we have a lot of guys that are really good. We have a lot of guys that are really unselfish. And we have a great coaching staff,” Folker said when asked what sets UCI apart from other squads. So with that in mind, Folker has made it his mission to make sure the basketball world knows who the Anteaters are, and the #FolkerSystem is a tool in accomplishing this goal. In addition to the motivational quotes that fill Folker’s Twitter account, he spearheaded a video project to highlight the squad and further promote the season, the players and the quest for a Big West title. So as you come across the inspirational, psychedelic Instagram photos filed under the #FolkerSystem or watch the black and white videos of the men’s basketball team doing drills and push-ups in the Newport sand that already has over 14,000 views, think of Folker and the Anteaters as they train harder and smarter than ever before. “Nothing comes without being earned,” said Folker. 2 Responses to "The #FolkerSystem Frenzy"